These two are able to play together more every day! So neat to watch their relationship grow. 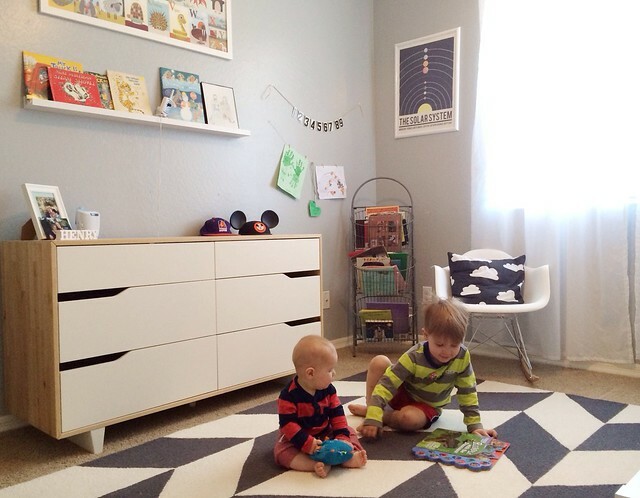 Our friends over at 4moms are hosting a killer giveaway alongside aden + anais and Skip*Hop. Enter here! My friend Miko started a blog- if you have a moment head on over and say hi. Jumping spiders, up close and personal. Ah! I already shared this NASA article on Twitter, but how scary is this? An interesting read: 40 Ounces to Freedom. Wishlist: these shoes, these pants, and this cute bicycle bell! One of my most favorite movies is 10 years old. Is Twitter getting rid of @-replies and hashtags? Oh, Shailene Woodley. Such a cool gal. Love this series that Hank does on his coffee blog. Maybe Katy Perry is a feminist after all. Happy birthday to two of my favorite blogging ladies. Great mail day: these sunglasses and these tees for the boys! On Turning 25 and Losing My Apartment. Almost 60% off the complete series of one of the best shows of all time. Wow! Georgia bans smoking and tobacco products at state universities. A history of Spring Break. Very interesting! Some great Journal Days from around the web: one, two, three, and four. And finally, I love this: "No more yes. It's either HELL YES. Or no." Loved the links this week! I especially enjoyed reading the spring cleaning link and the hell yes article. However, I absolutely did not click on the jumping spider link, eek! Thanks for reading my journal day! This has been such a great challenge for me so far. I love reading the prompts and making time to blog about something I might not otherwise. Not to mention, reading your responses & the other participants has been so inspiring. Fantastic links this week. I've just lost half an hour of my weekend. local honey from the farmer's market (or just local bee pollen in general) has been THE BEST cure for seasonal allergies for me. march-may used to be such a blur for me, but ever since i started eating a spoonful honey every morning and i haven't had any problem. Thanks for sharing Miko's blog! I read the entire thing and can't wait for more! OBSESSED with that room!!!!! Come do my home!